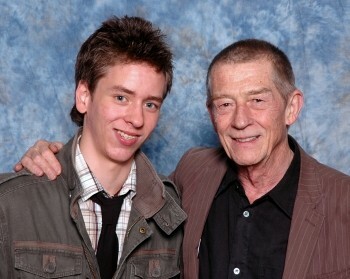 I was really pleased to meet one of our very best actors, John Hurt, at the London Film & Comic Convention in July 2008. 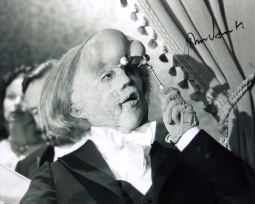 He was very friendly and we had a chat about his role in The Elephant Man. I told him how much I had enjoyed the film, which I have watched a number of times. He signed a still from the film for me. John also signed my Alien masterprint, and a photo from the film. his mother an engineer and amateur actress. He has a brother who is a monk in Ireland, and an adopted sister. 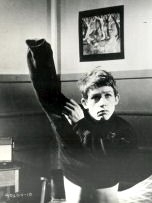 John attended a prep school in Kent (it was here, aged 9, that he decided that he wanted to act after seeing Alec Guinness as Fagin in the 1948 film Oliver Twist) followed by a boarding school in Lincoln. After two years at art school, he won a scholarship to RADA where he was finally to do the one thing he had always wanted to do - act. In 1962, he made his professional stage debut in Infanticide In The House of Fred Ginger and also his film debut in The Wild and the Willing (1962). In 1965 Hurt was 'spotted' by director Fred Zinnemann who gave him a small role in the film version of A Man For All Seasons (1966) which went on to win six Oscars. John Hurt became more widely known, and over the next decade, had a mixture of TV and film roles, including Daniel in In Search of Gregory (1969), Timothy Evans in 10 Rillington Place (1971) and Franz in The Pied Piper (1972). In 2002, Hurt was given an honorary degree by the University of Derby (something he described as giving him 'immense pleasure') and in 2006, received another from Hull University. Good quality film roles continued during the 1980s, notably as Winston Smith in the adaptation of Orwell's novel Nineteen Eighty-Four (1984) and Stephen Ward in Scandal (1989) the story of disgraced government minister John Profumo. 2001 was a good year for John Hurt, with critcally acclaimed performances as Dr Iannis in Captain Corelli's Mandolin and as Mr Ollivander, the magic wand seller, in Harry Potter and the Philosopher's Stone, a role which he has described as 'a lot of fun'. Not all of Hurt's films in the 1990s were succesful although there were exceptions like Rob Roy (1995). He says, "I've done some stinkers in the cinema. You can't regret it; there are always reasons for doing something, even if it's just the location." 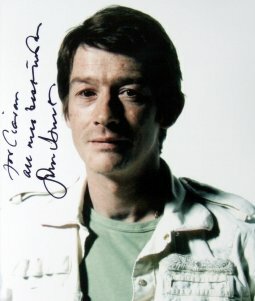 John Hurt was awarded the CBE in the 2004 Honours List, for services to Drama. In the 2015 New Year's Honours list, he was given a knighthood. John Hurt has been married four times and has two sons from his third marriage. him a BAFTA award for 'best actor' in 1981. Conservative politician Alan Clark in the 6-episode TV series The Alan Clark Diaries (2004-2006). 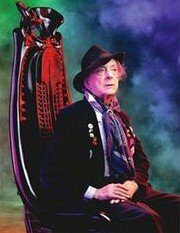 In 2008, John Hurt plays Quentin Crisp again in the ITV production of An Englishman In New York, this time following Crisp's adventures in his adopted city during the 1980s & 90s.